Been diving in Ray Point? Please Vote! The site gets its name from the many blue spotted rays that have made the site its home. It is a great dive site for this reason but it also provides divers with a chance to see many other species of the area. 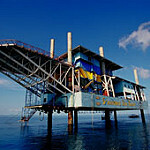 Found on the southern tip of Mabul Island, this is a great dive site when there are strong currents. Unlike other sites, the site is protected and sheltered from the brunt of strong currents and so is often a good choice when the currents pick up too much. The site slopes down to around 22 metres and starts at around 5 metres making it a good spot for beginner divers. Visibility is often poor at around 5 metres but averages around 20 metres, and even when the site is cloudy, divers will still be able to spot a huge variety of marine life. As well as the blue spotted rays found around the site, divers can also find many flying gurnards, ribbon Moray eels, and like other sites in the area, many species of nudibranchs. There are many sea fans and soft corals and so the site features many stonefish, parrotfish, damselfish, butterfly fish, moray eels, blennies, and gobies. Lionfish and groupers are also common to this site. Map of Mabul, Ray Point dive site.